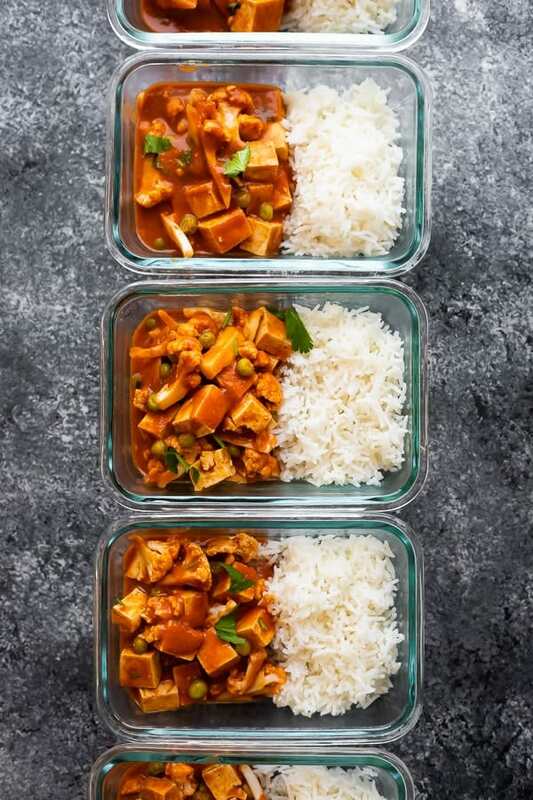 This vegan slow cooker tikka masala is PERFECT for meal prep! It makes an easy freezer crockpot meal, and leftovers keep (and can be frozen) for healthy plant-based lunches. Tofu. You either love it, or you hate it. One way you really can’t argue with tofu, is when it is smothered in a delicious, rich, creamy (VEGAN) tikka masala sauce! I have a serious absence of tofu recipes on the blog and it’s something I’ve been correcting over the past year. I’ve baked it, stir-fried it, grilled it, and now it’s getting the slow cooker treatment. 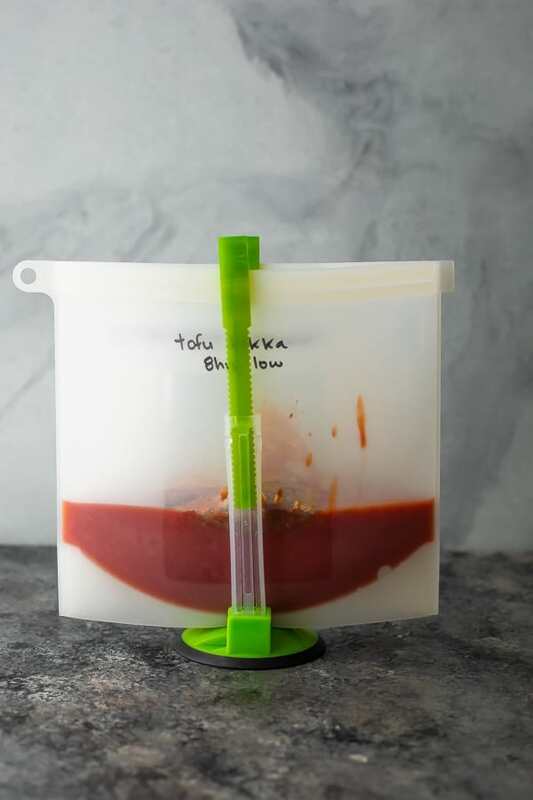 What I LOVE about tofu is the fact that it is pretty shelf-stable, so on nights when I forget to thaw anything out, good old tofu has my back. 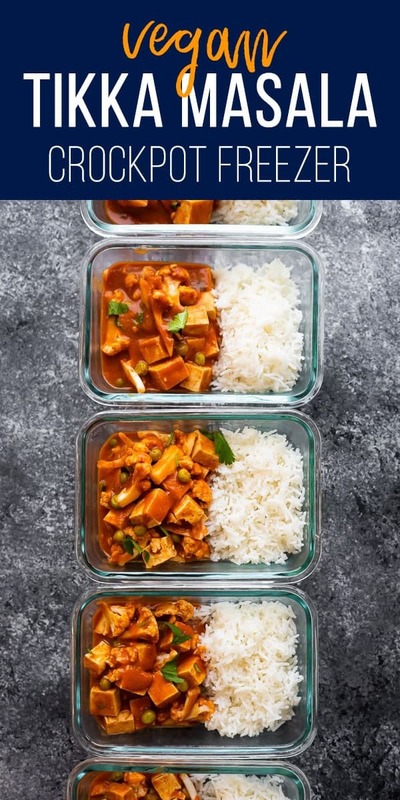 Traditional tikka masala has a yogurt sauce, and instead of swapping with coconut milk, which makes it a bit more watery, I swapped it with coconut yogurt for this vegan tikka masala. Not only does the coconut yogurt add the same thick & creamy factor as regular yogurt, but I found out during my testing for this recipe that you can freeze/thaw coconut yogurt (unlike dairy yogurt, which breaks). Yay! 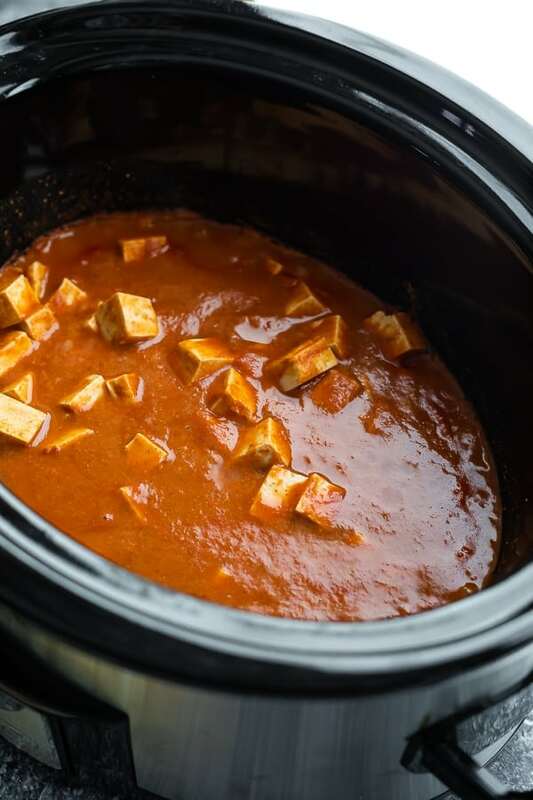 Combine the coconut yogurt, tomato sauce, spices and tofu in a slow cooker. 2 hours before serving add the veggies: I used finely chopped cauliflower and frozen peas. Enjoy with rice or naan bread. Can I really freeze the yogurt for this vegan tikka masala? If you use coconut yogurt- YES! It might look slightly scary when you dump it into the slow cooker, but it all comes back together as it cooks. The photos in this post are with freeze/thawed coconut yogurt. If you use regular yogurt- NO. It breaks and flakes and becomes all-round unappetizing. You can make this recipe with dairy yogurt, but I recommend adding it to the slow cooker fresh. 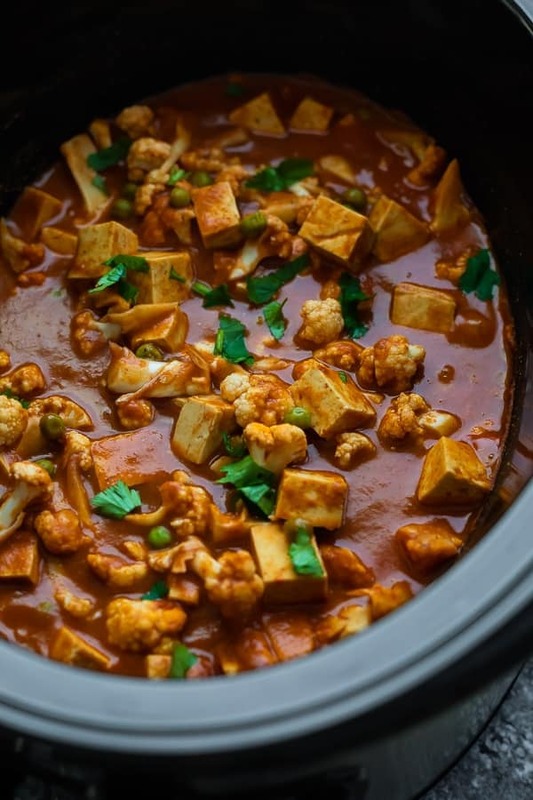 Do I need to press the tofu for this crockpot tikka masala? NOPE! Happy dances because I hate pressing the tofu. It’s not necessary for this recipe because you are not trying to get crispy tofu. 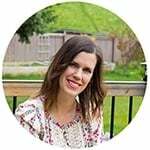 What other veggies can I use in this crockpot tikka masala recipe? How about frozen green beans, or broccoli, or even sweet potato cubes? If you do add sweet potato cubes, add them with the tofu as they need to cook awhile to soften. 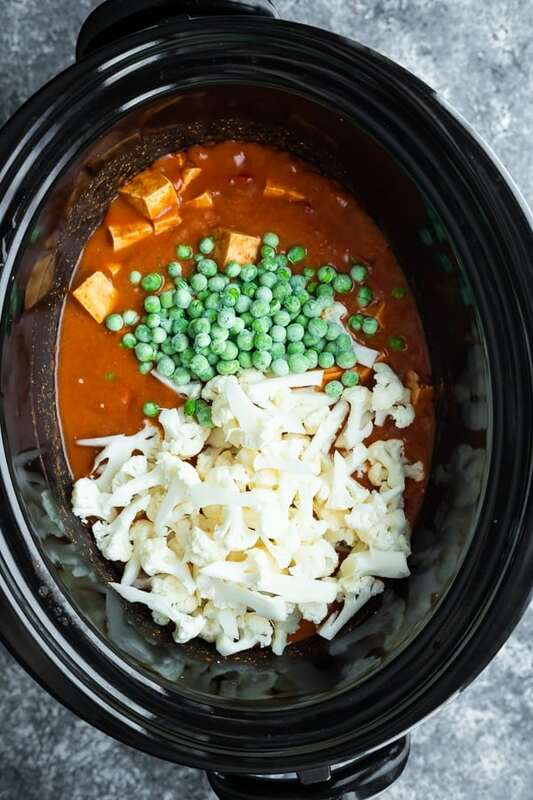 In the base of a 6 quart slow cooker, stir together the tomato sauce, coconut yogurt, and all spices. Cut tofu into 1/2 inch cubes, and stir into the sauce. Cook on low for 5 hours. 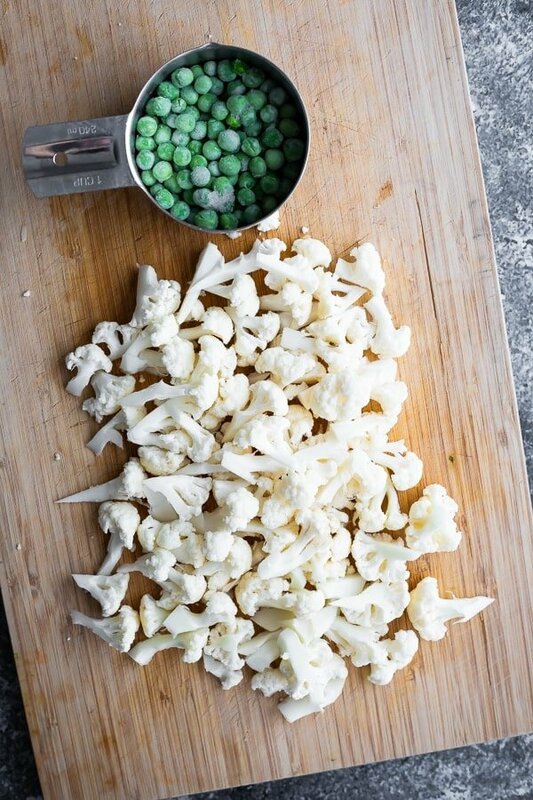 Add in 2 cups of very small cauliflower florets and 1 cup frozen peas. Cook on low for 1 more hour. Stir in cilantro leaves and enjoy with naan bread or served over rice. Combine all ingredients except for vegetables, cilantro and lemon juice in a freezer bag. Squeeze out as much air as possible and freeze for up to 3 months. 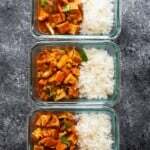 Store cooked & cooled tikka masala with rice in 2 cup meal prep containers in the fridge for up to 4 days. Reheat in the microwave until steaming hot. Cool completely and freeze for up to 3 months. Thaw completely before reheating. I like portioning mine out with rice for single-serve lunches.